ITEM #D15: VACUMATIC PELLET PUSHER FOR PARKER VACS. 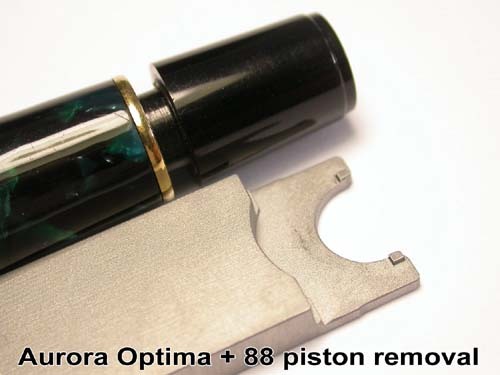 Use this to re-install a removed/damaged Vacumatic diaphragm on Parker Vacs and Vac 51s. This tool saves an amazing amount of frustration encountered when trying to get a new Vacumatic ball into the pellet retainer in the filling unit. Step-by-step instructions are given below with the photos. To buy please email Pentooling. BE SURE TO INCLUDE YOUR SHIPPING ADDRESS SO WE CAN PROVIDE A PRICE WITH SHIPPING COSTS INCLUDED. International customers please provide your phone # as it is needed for the shipping paper. 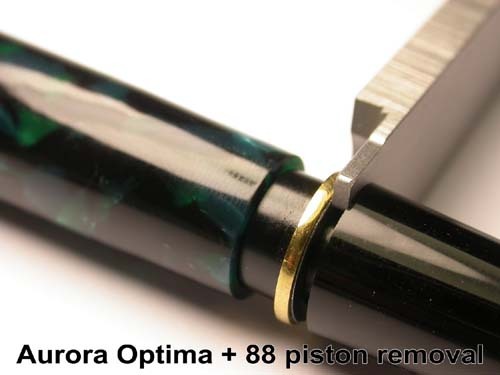 ITEM #MB-9: A TOOL FOR OPENING UP THE PISTON END OF AURORA OPTIMA + AURORA 88 PENS. The piston system sits very tight into the barrel. It is strongly recommended to warm the barrel before unscrewing the piston system. Also it is strongly recommended that you screw the blind cap knob down after inserting the tool. The tool has to be firmly held into the slots to avoid slipping and sliding during the opening. ITEM #D1: A SIMPLE ALUMINUM KNOCK-OUT BLOCK. SAME HOLE PATTERN AS THE D 16 AND PVC K-O BLOCK, ranging in size from 3/16" to 1/2" (ALL THREE BLOCKS ARE SHOWN BELOW). Fabricated from sturdy 1/8" aluminum with a more than adequate 2 3/8" clearance below the top surface for your nib and feed to drop out. When using the knock-out blocks listed below, remember to lubricate the section and feed, preferably by running it through an ultrasonic cleaner for a few minutes, and then heat it up with a heat source of about 150° Fahrenheit before trying to remove a feed and nib. Those two steps help a lot. Feeds are brittle and tend to be pressed in and glued in by old, dried ink. ITEM #D-16-P: A HOLLOW ROD FOR USE WITH A KNOCK-OUT BLOCK. Inner diameter of .140" (3.49mm) and 3" (76.2mm) length allow it to be used to push out feeds with fill tubes still attached. Made from 304 Stainless tubing, plug drawn with TIG welded seam and hard temper. This punch is designed to fit over every Sheaffer, Parker, and Eversharp fill tube I could find. The fill tube is a thin tube projecting from the back of the feed which would be destroyed by a solid punch when using a knock-out block. Knock-out blocks found in early Parker tool kits used these hollow punches, but mine will accommodate fatter fill tubes while having the same outer diameter allowing these to fit into smaller sections as well as the large ones. This improved design punch received rave reviews from Susan Wirth. ITEM #HAMMER: A 4.8 OUNCE HAMMER TO GO ALONG WITH YOUR KNOCK-OUT BLOCK AND HOLLOW PUNCH. A nice feeling balance and weight for pen repair use. Also has a ball peen side for peening over clip rivets when used with our Multiple Mandrel Set (MMS). ITEM #D16: A COMBINATION NIB BURNISHING BLOCK AND KNOCK-OUT BLOCK WHICH INCLUDES A HOLLOW PUNCH FOR THE KNOCK-OUT BLOCK. The burnishing block consists of 2 sets of both concave and convex channels (troughs and long humps) 4 1/8" (105mm) long, covering diameters ranging continuously from .160" (4.06mm) to .5" (12.7mm). I started out designing this burnishing block by measuring all the diameters and lengths of the troughs in 5 different vintage nib blocks obtained from Parker and Barrett surplus tooling plus one block owned by a fellow vintage pen tool collector in Europe. I made sure this block covered all contours contained on those blocks as defined by the diameters and lengths of those vintage blocks. This block is made from heat treated aluminum alloy 6061-T6, much harder than gold. The knock-out block holes range from 3/16" (4.7mm) to ½" (12.7mm). The hollow punch (included) is designed to fit over every Sheaffer, Parker, and Eversharp fill tube I could find. The fill tube is a thin tube projecting from the back of the feed which would be destroyed by a solid punch when using a knock-out block. Made from 304 Stainless tubing, plug drawn with TIG welded seam, hard temper. Knock-out blocks found in early Parker tool kits used these hollow punches, but mine will accommodate fatter fill tubes while having the same outer diameter allowing these to fit into smaller sections as well as the large ones. This improved design punch received rave reviews by Susan Wirth. ITEM #ACRYLIC BLOCK: ACRYLIC NIB BLOCK. An economic solution for those desiring a nib smoothing platform. Provides both concave and convex surfaces to put under nibs while burnishing them. 4 1/2" X 2". ITEM #VISCONTI NIB: NIB REMOVAL TOOL FOR VISCONTI OVERSIZED HOMO SAPIENS and DIVINA as well as OMAS MOMA. Hardened german steel prongs fit into slots at the base of the nib unit on these pens. The business endsFor Working On Pens of these tools are coated with red lacquer for padding to avoid scratching the nib. The photos show 2 of these tools for clarity. You only need one to remove a nib. ITEM #FILES: SET OF 10 RIFFLER FILES. Small, curved, and double sided. ITEM #SHIM STOCK: BRASS OR STAINLESS STEEL (SPECIFY WHICH WHEN ORDERING). USED AS A FULCRUM BETWEEN TINES WHILE TORQUING TINES STRAIGHT AND ALSO USED TO CLEAN THE SLOT. When aligning a nib, a good target is to have a slit with parallel edges spaced so that a 0.001" shim will easily fit into it but not fall out. A good general flossing shim thickness is 0.002". 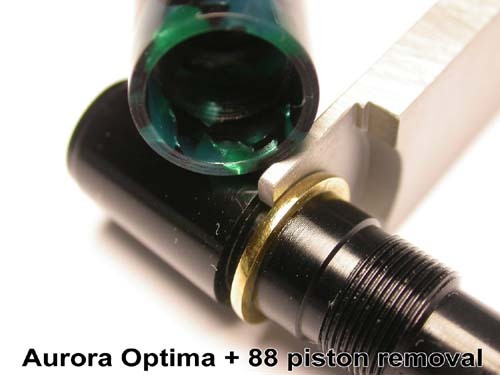 (You do not leave the shim in the nib as in an automotive bearing adjusting application). Handle these with care as they have sharp edges. Wear gloves and/or finger cots when using them. A set comes with a 1/2" x 3" piece of each of the following thicknesses: 0.001", 0.002", 0.003", 0.004", & 0.005". Available in rust proof stainless steel or brass. Don't use your old spark plug feeler gages. 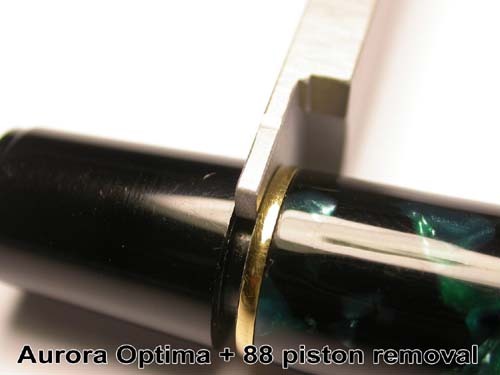 they usually start out at .010" which is thick enough to do serious damage to your nib. Brass is softer and less likely to scratch gold slit walls. Stainless is stiffer and more easily directed. More rigid than brass in the smaller thicknesses. What thickness of shim stock to use: General 'Flossing' to remove gunk is done with .002". 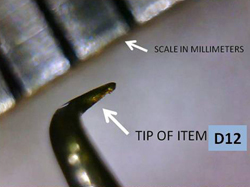 For a standard, normal nib tine gap, it should take in a .001" shim which should then hold itself in without falling out. Parker used to supply their authorized repair stations with .0015" thick shims. If you want to adjust flow, the thickness of shim stock used depends on the stiffness of the nib, the thickness of the metal, and a whole lot of other unique characteristics of a given nib coupled to what you want to do to that given nib. Shim stock is also used as a fulcrum to move nib tines in certain directions in some nib straightening maneuvers. I can't really tell you everything about using shim stock in a couple words or a couple pages. I've spent thousands of dollars to spend multiple days with a nib expert trying to learn things like this related to nibs and I still don't consider myself good at it. ITEM #TWEEZ 2: PRECISION TWEEZERS, 6.5" LONG, WITH TORQUE LOCKING PIN NEAR TIPS. Locking pin prevents tips from separating when twisting. Very small, long tips for reaching and grabbing tiny objects. ITEM #TWEEZ 3: PRECISION POINTED TWEEZERS, 4.5" LONG. ITEM #TWEEZ 1: Tweezers. 4 1/2" long, flat, wide jaws. ITEM #UHF PADS: ULTRA HIGH FRICTION GRIPPING PADS. These pads, approximately 5.5" (14cm) X 3.25" (8.25cm), provide about the surest non-damaging, non-abrasive grip that can be had on pen barrels and hoods / shells to turn them while un-screwing them. With a latex like softness they wrap around and lock onto the cylindrical parts that you want to disassemble. These are totally non-abrasive and non-scratching. These pads are so sticky that a pen sticks to them while the pads are vertical as shown below. ITEM #D8: PEN SAC SIZE GAGE. A duplicate of the White Rubber Company gage found in pen repair guy’s tool kits. Made from .115" (2.9mm) thick aluminum. The sac will usually fall freely through the labeled hole corresponding to its diameter. The size designations under each hole represent the outside diameter of the sac in 64ths of an inch. The number of 64ths is also the sac number. If you're clever like Jim Marshall is, you can figure out how to use this as a knock-out block also. By the way, take a look at the last photo for this item which is a screen clip of an email I got from a buyer of this item. ITEM #PIPE CLEANERS: FOR GETTING INTO TINY AREAD TO CLEAN. ITEM #8057: PARKER 51 FOUNTAIN PEN CAP ARBOR. 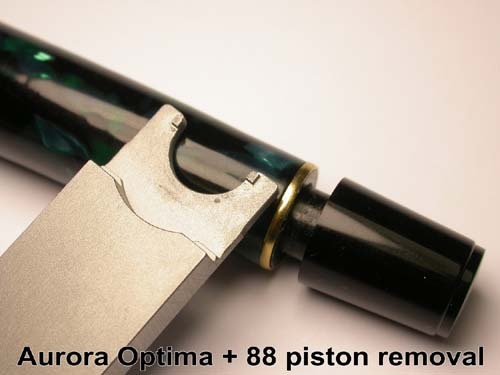 Use this tool to lock onto the inside of the inner cap on a Parker 51 fountain pen so you can go to the other (outside) and remove the jewel ("Clip screw, really) and bushing using other tools (Gooey cubes and item #13732) while applying torque through the large, comfortable handle on this tool. This is a duplicate of Parker repair tool #8057. ITEM #13732: PARKER CAP BUSHING CENTER PIN SCREW DRIVER/WRENCH. This is another duplication of an original Parker tool crib wrench that is guaranteed to inprove your quality of life. 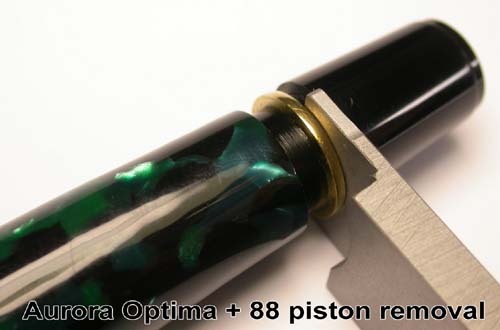 This will self center and safely remove (without damaging the clip ring) the bushing that holds the clip onto the cap of Parker fountain pens (Vacs & 51s), ballpoints, and some pencils that have jewels (Clip screws) and bushings holding them together. Like the Parker original, it has a spring-loaded, retracting center pin to fit into the hole left after the clip screw (jewel) is removed. AND if the plastic threaded shaft from the clip screw / jewel has broken off inside the bushing, the spring action of the aligning center pin causes it to retract so you can still unscrew the bushing. A pleasure to use, especially after you've kept mis-placing that exact sized, still square edged screw driver that would fit some of the Parker bushings you encounter (but it would still scrape some of the gold off of the clip ring). ITEM THRD CHSR: THREAD CHASERS, 36 THREADS PER INCH (TPI) AND 48 TPI. Use these for dressing up threads that have been damaged, mis aligned, or maybe filled with glue. These are the most common pitches used by the biggest manufacturers of pens. Always make sure the pitch matches before applying much force with these. You may want to use a thread gage on your pen. Specify the pitch you need (I only have 36tpi and 48 tpi). These are more goodies from the Parker tool crib; they are for external threads only and will not work for internal threads because they won't fit inside your cap or barrel. Double sided. ITEM #D10: A CLASSIC PEN TOOL, A SAC EXPANDER. Since being developed at the start of the iron age, this has been the most often used tool of any pen repair person. Insert the prongs into the sac and squeeze the handles to easily open up sacs so they can be installed on the section with a little shellac. Note: at the recent San Francisco Pen Show, a depressed repair guy walked up to my table, desperate to find something to use as a spanner to get his torelli pen's filling unit apart. After he poked and jabbed the interrupted screw slot with 3 different spanners intended for Sheaffers as well as a number of probes and unrelated tools, with no success, I handed him one of these and it easily unscrewed the split screw in the Torelli. This type of screw is used in several pen brands and consists of a recessed screw with a slot that is interrupted in the center by a shaft which passes through the screw, usually being a part of a piston or a plunger. So you can't use a straight screw driver; maybe one with a slot in the middle of the blade. ITEM #D9: SHEAFFER PLUNGER SHAFT GUIDE - IMPROVED. This and the next four tools are intended to prevent you from going nuts while working on Sheaffer pneumatics (Plungers, Snorkels, and TouchDowns). This tool makes it unnecessary for you to poke the plunger shaft around trying to find the hole that goes through the rear of the barrel/seal while inserting the threaded tip of the plunger back through the seal. This operation is especially difficult since the plunger shaft length is close to the length of the barrel and your fingers don't fit into the barrel. This is almost an exact duplicate of the Sheaffer tool found in Sheaffer repair guy's tool kits. I say almost, because I embellished the design by making the business end long enough to go ALL THE WAY THROUGH the barrels so you can align the dimple in the tip of the tool's shaft with the end of the plunger shaft and slide the shaft right through the seal without poking around blindly. The shaft of this tool is the same diameter as the plunger shaft, so the junction of the two shafts slides right through the rear seal. 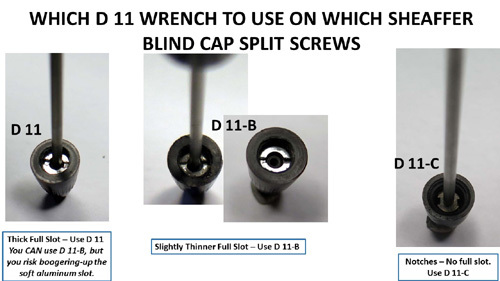 ITEM #D11, D 11-B, and D 11-C (SPECIFY WHICH AFTER READING BELOW): TOOLS FOR REMOVING BLIND CAPS FROM SHAFTS ON SHEAFFER VACUUM FILLING PENS. A screw with a relatively fatter slot releasable using wrench D-11. A screw with a thinner slot releasable using wrench D 11-B. You COULD also use wrench D 11-B on the fatter slotted screw in a), above, but you would booger-up the slot in the very soft aluminum, much the same way that too small of a regular screw driver would damage a slot thicker than that for which the screw driver was intended. If there is play when the tool is inserted into the slot, better go to tool D 11 before applying torque. A screw with just a notch on either side of the shaft on the circumference of the screw, not a continuous slot, releasable using wrench D 11-C.
66% of the 137 pens and parts pens in my inventory that I’ve checked use the first, more simple, direct screwing of the shaft into the blind cap using no screw while 14% utilize method a) above, 6% utilize method b), and 14% utilize method c). 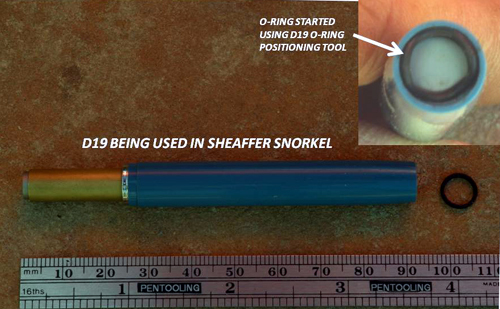 ITEM D19: SHEAFFER SNORKEL and TOUCHDOWN O-RING SEATER. A double-sided tool that gets inserted into the front of the barrels of Snorkels (one end) or into the barrels of Touchdowns (the other end of the tool) to provide a stopping point, or a small, round platform to help you get the o-ring into the groove in the back of the pen. 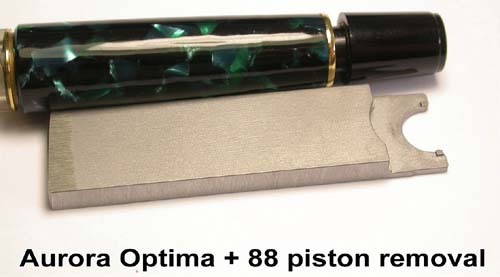 A variation of an old Sheaffer repairman's tool called a "COMPRESSION GASKET STOP". But this one is two sided, to accommodate two different pen models. It also comes with a metal tamper with an O-ring sized circular notch to help seat the O-ring from the top of the barrel once you get the O-ring in roughly the correct position. ITEM #DREMEL: DREMEL MODEL 380-6. Variable speed, 110 volt AC powered. Comes with both 3/32" and 1/8" mandrels. 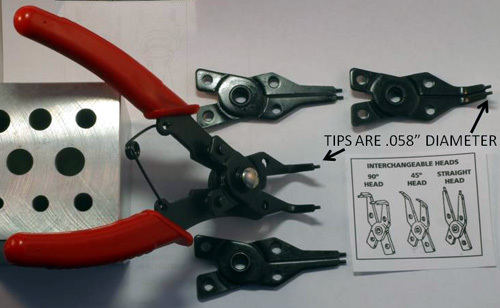 ITEM #PT03316: PLIERS WITH PIN TIPS FOR SPANNING SCREWS WITH CENTRAL SHAFTS. These are intended for turning slotted screws that have a shaft going through the center. They come with 4 interchangable heads, all with .058" diameter (1.48 mm) pins on the tips (1/4" machine screws typically have a .065" wide slot as an example of scale). The heads are at 3 different angles, depending on the head. The orange one is for clearing out broken and jammed-in .036" (.9 mm) leads from pencils. The black one is for clearing out broken and jammed-in .046" (1 mm) leads from pencils. The black one also can be used to clean-out/extract the broken end of the metal fill tube in a Parker Aerometric feed (NOT vacumatics). The largest (yellow) bit can be used to remove any broken-off fill tubes (or gunk in the hole for a fill tube) for Parker Vacumatics (don't get this confused with an Aerometric fill tube, which is a lot smaller and uses the black bit). The micro chuck is for handling the black and orange smaller sized bits. The yellow one is much larger and easier to turn with your fingers. It is recommended that all of these be turned by hand. They CAN be put in a dremel or flex shaft drill, but a lot of damage can be done that way and these jobs can usually be done by turning the bits by hand. These are some of the sizes on the left hand side of the back row in your drill index that were broken or lost a long time ago and are not available at HD or your local hardware store. These sizes come in very handy when you're working on pens/pencils. $12 set, 3 bits + micro chuck. ITEM #GOOEY CUBE: THE MOST NON-SKID, STICKY, SEMI-RIGID SURFACE I'VE FOUND IN MY 32 YEARS OF PEN REPAIR. You won't think these are sticky when you just hold them, but they are the best I've found to remove Parker clip screws (Jewels). I got an email from a buyer claiming they COULDN'T work. Turned out he hadn't tried it yet. I told him to try it and got an email from him the next day to tell me he had tried it and it worked so well that he sheared the dome of the clip screw off of the threaded portion. And he thanked me for such an effective tool (Although you don't want to torque it so hard that you shear off the top of the clip screw (jewel). Keep in mind that NOTHING short of a drill is guaranteed to remove a Parker clip screw (jewel), but you won't find anything that works more often than this. ITEM #HT-V: SQUARE, CONVEX BURNISHER. This is for those odd situations where you need a burnisher with a square edge on the front, rather than curved. Double-sided with a convex shape with square corners. THIS UNIT WILL FACILITATE THE TEAR-DOWN OF NEW AND VINTAGE PENS BY SOFTENING UP ADHESIVES, GUNKED-UP THREADS, PARKER JEWELS & SCREWED IN BUSHINGS, AND JUST PLAIN STUCK TOGETHER BRITTLE ITEMS WHILE GREATLY DIMINISHING THE CHANCES OF BREAKAGE TO YOUR FRAGILE ANTIQUE PENS. DON'T USE A HEAT GUN, WHATEVER YOU DO; THE TEMPERATURES PRODUCED BY HEAT GUNS CAN VERY QUICKLY INITIATE A STRONG FLAMABLE REACTION IN CELLULOSE NITRATE, OF WHICH MANY VINTAGE PENS ARE COMPOSED. HEAT GUNS CAN ALSO FLAT-OUT MELT OTHER PLASTICS. THIS UNIT USUALLY WILL LOOSEN UP FROZEN THREADS. DON'T SMACK YOUR THREADED SECTIONS SHARPLY ON THE EDGE OF A COUNTER TO LOOSEN THEM UP LIKE THE OLD PEN REPAIR MANUALS TELL YOU TO. NOTHING WILL DESTROY A PEN'S VALUE FASTER THAN THAT. THIS IS ABOUT 90 YEARS AFTER THOSE INSTRUCTIONS WERE WRITTEN. 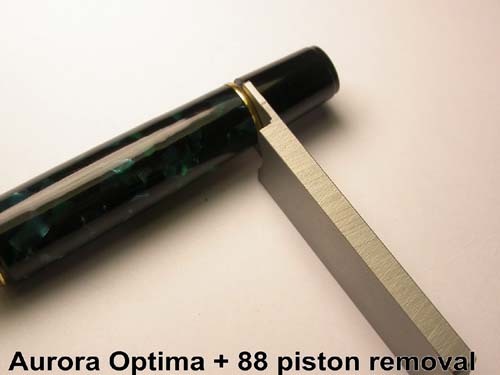 THIS UNIT PROVIDES A FAST MOVING STREAM OF AIR AT APPROXIMATELY 150 DEGREES F MAX, WHICH IS ADEQUATE FOR ALMOST EVERY FOUNTAIN PEN DISASSEMBLY OPERATION. AFTER 15 YEARS OF USING, DEMONSTRATING AND SELLING THESE UNITS, I FIND THE BEST WAY TO CONTROL THE TEMPERATURE OF THE PIECE YOU ARE WORKING ON IS TO TURN THE WARMER ON AND VARY THE DISTANCE FROM THE HEAT PORT AND THE TIME THE PEN IS IN THE WARM AIR STEAM PRODUCED BY THIS UNIT WHILE KEEPING THE PIECE ROTATING. IT HAS A DIGITAL TEMPERATURE CONTROL TO SET THE DESIRED TEMPERATURE. ALWAYS KEEP THE PIECE MOVING AND KEEP IT IN YOUR HAND. DON'T WALK AWAY WHILE A PEN IS IN THE WARMER. ALMOST EVERYONE I'VE SOLD ONE OF THESE TO HAS COME BACK AND TOLD ME HOW MUCH THEY LOVE IT AND HOW MUCH IT HELPS. THE GUY RUNNING THE CHICAGO PEN SHOW CAME BACK TO MY TABLE A YEAR AFTER BUYING HIS FIRST ONE AND BOUGHT A SECOND UNIT FOR A FRIEND. EVERY BUYER AGREES THIS UNIT IMPROVED THEIR QUALITY OF LIFE. THIS RUNS ON 120 VOLTS, 60 CYCLES AC AND USES A STANDARD USA TYPE THREE PRONG GROUNDED PLUG. RECOMMEND USING A TEMPERATURE MONITORING PROBE WITH THIS HEATER - ALSO SOLD HERE - BELOW. ITEM DIGITAL THERMOMETER: GREAT FOR USE WITH PEN WARMER, ABOVE. Range is -58 to 200 degrees Fahrenheit, sampling every 10 seconds. ITEM #SYRINGES/BLUNT NEEDLES: HIGH RESOLUTION APPLICATORS TO PUT YOUR SOLVENTS, PLASTIC WELDING AGENTS, INKS, AND OTHER LIQUIDS RIGHT WHERE YOU WANT THEM. 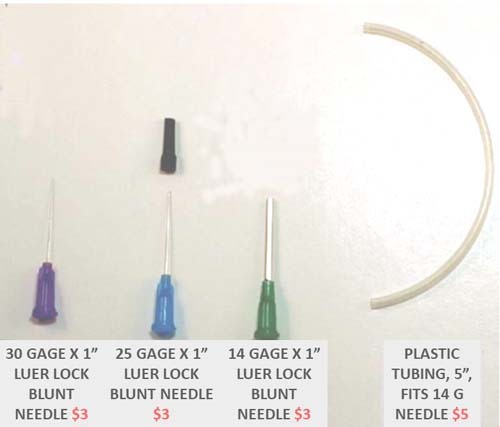 These are blunt needles and Luer Lock syringes, which means they all screw into each other as well as into the 1.25 ounce plastic bottle you'll find listed next on this page. The sizes of the needles offered go from very small (30 gauge = .010" / .255 mm) to pretty big (14 gauge = .064" = 1.63 mm) in various lengths. A note on gauges: These correspond to American Wire Gauges; the higher the gauge number, the smaller the diameter of the needle. Tubing that fits over 14 gauge needles is also available in 5" lengths for creative micro plumbing tricks. The needles all come with scabbards to cover the tips for storage, except for the 30 gauge ones. See the photos below for pricing. ITEM #LUER LOCK 1.25 OUNCE BOTTLE: A HIGH DENSITY POLYETHYLENE LUER LOCK BOTTLE THAT IS RESISTANT TO ALL SOLVENTS I'VE TRIED IT WITH. Including acetone, gasoline, alcohol (ISA), cyanoacrylate ester, methyline chloride, and several inks. I've also used them successfully with very viscous materials such as Elmer's Glue and shellac. This bottle is fitted with a 20 gauge Luer Lock blunt needle and it has a cap with a wire that fits inside this hollow 20 gauge needle when the cap is put on the bottle. This 20 gauge needle can be replaced with other Luer Lock needles but then the wire in the cap will not fit inside the needle when the cap is put on if the replacement needle is smaller than 20 gauge. If you wish to use a smaller Luer Lock needle on this bottle, you can pull the wire out of the cap with a pair of pliers and then use the cap on the bottle with the replacement needle. There are a lot of fittings on this bottle and it does not provide a positive, all position seal for ink, which is made to penetrate. The point here is that you can use this bottle for filling eyedropper filled pens and cartridges and then store it upright with no problems, but don't fill it with ink and carry it around in your pocket. The pressure built up when the bottle warms up to body temperature while sealed will cause leaks if the bottle is not upright. This is a good ink dispensing tool, but it is not a portable pocket inkwell. You can use this with superglue, but you can only use it once. The wire WILL get glued in the needle if you put it back in with glue inside. You can use it on more than one super glue job, but they all need to be done at the same time. ITEM #APPLICATOR COMBO PACK: Buy this package and save over the total individual prices shown above. ITEM #LGE VAC JEWEL TAP: A TAP FOR STRAIGHTENING OUT THE THREADS IN THE CLIP BUSHING IN THE CAP OF A PARKER VACUMATIC / 51 AFTER YOU'VE REMOVED THE BROKEN-OFF PLASTIC CLIP SCREW ("JEWEL") FROM THE BUSHING. Clip screws sometimes shear off when you're trying to remove them when you need to get at the clip bushing slot to remove the clip. You then have to use a bud burr and/or a pick to break-up the threaded part of the clip screw ("Jewel") that remains stuck in the clip bushing so you can screw a replacement clip screw into the bushing. After that, the threads are usually boogered-up, preventing an easy insertion of the replacement clip screw ("Jewel"). This tap will solve that problem for the second smallest size of clip screws (both of the smaller sizes frequently shear off). This larger of the two smaller sizes is more often used on pre-51 Vacs, but some 51s use this size also. The pre-51 Vacs also use some much larger thread sizes, but those sizes are less likely to shear off. That's why I offer the smaller 2 sizes here (see next item also). To determine which size you need, this larger one is for clip screws ("Jewels") with a thread O.D. of approx. .118". if you don't have a micrometer, try comparing the thread size to a known drill bit size. ITEM #SML VAC JEWEL TAP: THIS COMPLEMENTS THE ITEM ABOVE and is USED FOR THE SMALLER CLIP SCREW ("JEWEL") THREAD SIZE WITH AN O.D. OF APPROX. .O93". This is the more common size used on 51s, and some other Vacs , pencils, and ballpoints use this size. ITEM #BUD BURR: PARKER VAC BALL REMOVAL BURR - ALSO GREAT FOR REMOVING SHEARED-OFF CLIP SCREW ("JEWEL") THREADS FROM CLIP BUSHINGS. 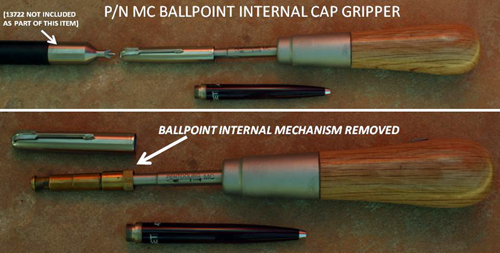 An ideal tool for putting a pinhole in the ball left over from a deteriorated diaphragm in a Parker Vacumatic. This will leave a hole the correct size for a pick to follow and complete the ball rremoval job. Small enough to fit through the hole that the filling unit has in it. You may want to add liquid (as a lubricant - diluted detergent solutions work well) followed by a little heat to soften things up and avoid damaging the brittle hard rubber socket that some Vacs use. DON'T USE A HEAT GUN!!! 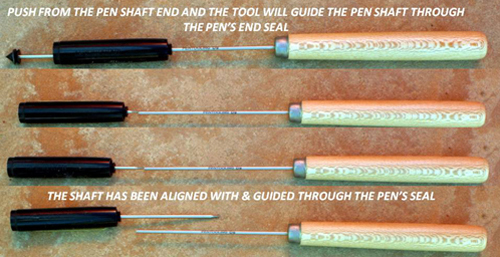 Use this tool in a rotary tool such as a Dremel or flex-shaft grinder in conjunction with a pick. This has a 3/32" shaft. Another helpfull tool for this job is a vacumatic ball drilling shield to protect hard rubber sockets from damage while boring a hole in the ball. We also supply replacement hard rubber ball retainers for Vac diaphragms, as well as complete Vac filling units. NOTE: The three brushes presented below are all different sizes and are not interchangable; we've scoured the planet to find the perfect sized brush for each application below. ITEM #STD SNORK BRUSH: This brush is the optimal diameter to clean-out the sac residue that becomes welded onto the walls of the metal sack protector found inside a Sheaffer Standard sized snorkel. If you run into the problem where the complete sac won't come out because it is stuck to the walls of the sac protector after you've gotten the sac protector off of the pen and removed the plug, go outdoors and put the sac protector in a shot glass and fill the shot glass with acetone. Don't do this indoors, don't let kids near it, and don't get the acetone on yourself or the rest of your pen, and warn anyone that gets near it what you're doing so they don't drink it. Let the sac protector soak for about a half hour, remove it from the acetone, and clean the old (now softened) rubber out with this brush. No need to ruin your foil-thin metal sac protector with a drill bit, which can come out the opposite end of the sac protector along the axis or ruin it by having the drill bit push the rock-hard old rubber outward in a radial direction. ITEM #PFM BRUSH: This brush is the optimal diameter to clean-out the sac residue that becomes welded onto the walls of the metal sack protector found inside a Sheaffer PFM snorkel. If you run into the problem where the complete sac won't come out because it is stuck to the walls of the sac protector after you've gotten the sac protector off of the pen and removed the plug, go outdoors and put the sac protector in a shot glass and fill the shot glass with acetone. Don't do this indoors, don't let kids near it, don't get the acetone on yourself or the rest of your pen, and warn anyone that gets near it what you're doing so they don't drink it. Let the sac protector soak for about a half hour, remove it from the acetone, and clean the old (now softened) rubber out with this brush. ITEM #TOUCHDOWN BRUSH: This brush is the optimal diameter to clean-out the sac residue that becomes welded onto the walls of the metal sack protector found inside a Sheaffer Touchdownl. If you run into the problem where the complete sac won't come out because it is stuck to the walls of the sac protector after you've gotten the sac protector off of the pen and removed the plug, go outdoors and put the sac protector in a shot glass and fill the shot glass with acetone. Don't do this indoors, don't let kids near it, don't get the acetone on yourself or the rest of your pen, and warn anyone that gets near it what you're doing so they don't drink it. Let the sac protector soak for about a half hour, remove it from the acetone, and clean the old (now softened) rubber out with this brush. ITEM #CIRCLAMP: A circular band clamp, adjustable, with a tightenable stainless band .236" in width. These are very helpful while repairing cracks in caps & barrels. They also help out, with the addition of a LITTLE heat, in compressing sloppy threads from the outside of a cap. The band is shortened by tightening the wide knurled screw on the handle. This pulls the tails of both bands through the slot, tightening the band. We use stainless steel for our bands, while the competition sometimes uses brass which tends to stretch more than stainless and has about a 20% higher thermal coefficient of expansion than stainless (i.e., the band can loosten, especially if you are using heat). When using these with liquids, you may want to put a membrane of non-soluble plastic wrap between your workpiece and this tool. If you have used one of these to repair barrel threads, leave it on the threads until you have re-installed the section to prevent re-opening of the crack while putting in the section, then before removing the clamp, heat the entire assembly USING A 200 degrees Farenheit source and set it aside to relax & cool-down before removing the clamp. Moderate heat is your friend when doing pen repairs. DON'T EVER USE A HEAT GUN ON A PEN, no matter how adjustable it is!!! REMEMBER: TRY NOT TO MESS WITH THE SHORT KNURLED FITTING; THAT'S FOR LOCKING THE ENDS OF THE BAND INTO THE SLOT IN THE CARRIAGE. USE THE WIDE KNURLED FITTING TO MOVE THE CARRIAGE BACK AND FORTH, TIGHTENING & LOOSTENING THE BAND. THE AMOUNT OF BAND (3") INSTALLED IS LARGE ENOUGH TO ACCOMMODATE DREADNAUGHTS AND MONTBLANC 149s. IF YOU BREAK, BEND UP, OR WANT A LONGER BAND, WE CARRY 3" & 6" REPLACEMENT BANDS. ITEM #CLAMPBAND: 3" replacement band for above. ITEM #LONG CLAMPBAND: 6" replacement band for above. ITEM #WAX BRUSH: WAX & TIGHT SPACE CLEANING BRUSH. Great for a final detailing after you've polished and/or waxed your pens. This is great for softly removing dried polishes and waxes out of threads, out of recesses around lever boxes, or out of the tight right angle where the nib/feed assembly goes into the section. This has bristles which are soft enough to not scratch but stiff enough to remove dried polishes/waxes out of tight spots. This is one of my favorite and most used tools.Bristles are 5/8" long in a pattern measuring 5/8" wide by 4 3/4" long. ITEM #PT16080: Tapered section & barell brush. One of our hottest selling items! Fits inside of sections and small barrels for non-scratching cleaning. 3/16" to 7/16" dia. Stiff wire handle. ITEM #PT16081: Straight barrel & cap brush. Our second hottest selling item! Slightly larger diameter than the tapered bruch, above, 1/2" dia. Stiff wire handle. ITEM #BRUSH COMBO DEAL: Both of the above brushes for $7.00 (or, 2 of either). ITEM #RUBBER GRIPPER STRIP: This is a handy, sticky, soft rubber strip measuring 1" X 7 1/4" and about .13" thick (3.4mm). These things are great for getting traction between your hands and the barrel or section of a pen when you want to twist them relative to each other (as in dis-assembly). ITEM #RUBBND: VERY THICK STICKY 1/2" DIA. RUBBER BAND FOR GRIPPING ROUND, ROD SHAPED ITEMS WITH YOUR HANDS. Increase the friction. ITEM #LATEX GRIPPER SHEET: This is a thin, sticky, soft latex rubber sheet measuring approx. 2.75" X 5.25" and about .026" thick (.65 mm). These are great for getting traction between your hands and the barrel or section of a pen when you want to twist them relative to each other (as in dis-assembly). Also very helpful in getting clip screws (jewels) on the tops of Parker caps to turn. Only the latex sheet is included with this item, not the pliers or the coral Carter's pen. ITEM #PT98563: Digital Caliper. 6" range, Zeroing button, inch/mm switch, metal rail. Uses LR44 Battery. 0.0005" / 0.01mm Resolution. ITEM #PT93293: 6" Composite Digital Caliper. Zeroing button, inch/mm switch, composite rail. Resolution: .01" / .1mm. Uses SR44 Battery. ITEM #SHIM STOCK: BRASS OR STAINLESS STEEL (SPECIFY WHICH WHEN ORDERING)USED FOR GENTLY SPREADING NIB TINES FARTHER APART TO CHANGE INK FLOW AND ALSO CLEAN THE SLOT. When aligning a nib, a good target is to have a slit with parallel edges spaced so that a .002" shim will easily fit into it but not fall out. 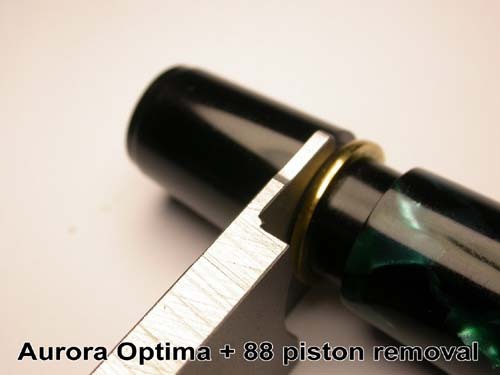 (You do not leave the shim in the nib as in an automotive bearing application. Handle these with care as they have sharp edges. Wear gloves and/or finger cots when using. A set comes with a 1/2" x 3" piece of each of the following thicknesses: .001", .002", .003". .004", & .005". Rust proof stainless steel or brass. Don't use your old spark plug feeler gages. they usually start out at .010" which is thick enough to do serious damage to your nib. Brass is softer and less likely to scratch gold. Stainless is stiffer and more easily directed. More rigid than brass. ITEM #BULB: A FLUSHER FOR ASSEMBLED CARTRIDGE FILLING PENS. Put your own cartridge with the back cut off in the nozzle of this bulb (it stretches quite easily, especiallly if you add a little heat) or stretch the nozzle over the tail end of the front end as shown in the picture. Fill it with water and/or detergent and it's very helpful in cleaning out the ink channels through sections, feeds, and nibs. Cartridge is not included. ITEM #FINE TINY BRUSHES: These small brushes have bristles that arte .005" diameter which make them great for applications where you need someting that small to fit. Cleaning the spaces between the fins in a 51 collector comes to mind. These brushes, with a little Simichrome polish, are also great for getting the black patina (Gunk) out of those little tiny characters making up the imprints on light colored pens, like Mandarin and red/orange, cream, coral, or light green. Try them on cleaning threads on light colored pens, also. These are soft, tiny bristles, great for cleaning corners, crevices, & tiny areas. they fit inside most barrels and caps, also. They don't scratch. I use these a lot for cleaning and removing polishing residue in my own work on pens. ITEM #4365: A NIB BLOCK SCALVAGED FROM THE PARKER TOOL CRIB IN JANESVILLE. This is a real relic / souveneir for Parker enthusiists, used in the past by real Parker technicians. Largest radius is .240" (6 mm) and the largest is .120" (3mm). This block and 4 others wer used to help choose the radii used in D16 above. All the racii on this block are shown in the hand annotated scan shown as the last photo below. Oone end there are the numbers "7 18 17" and some sort od stylized marking, possibly a machinist's mark. The hardness of this steel was measured as 10 on the Rockwell HRC scale. ITEM #WHITE RBR GAGE: A GENUINE RELIC FROM THE PAST OF OUR AVOCATION; This is the same in form, fit and function as the D8 Sac Gage (listed above), but wheras the D8 is a reproduction, this is an original, made by the White Rubber Company and found in the Parker tool salvage from Janesville. Think of the Karma and spirituality this thing has! it's infused with the ghosts of Parker employees that used it. ITEM #4429: SHIM STOCK HOLDER. Both a handle and a magazine for small pieces of shim stock.The front end clamps onto a piece of shim stock and the back end opens up to access a supply of different thicknesses of shim stock. Refills are also available for $15.